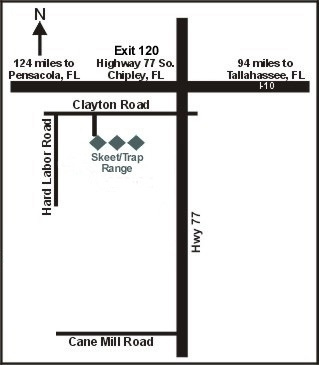 From Interstate 10 (Exit 120), take Highway 77 south 3.2 miles to 2131 Clayton Rd. on your left. From Interstate 10 (Exit 120), take Highway 77 south 6 miles to Cane Mill Rd. and turn right. Go 1.2 miles and look for sign and turn right at sign. Follow the road to the lodge.